Heat oven to 350°. Brown meat; drain. Stir in salsa, corn, dressing and chili powder. Layer 1/2 each of the meat mixture, chips and cheese in 2-quart casserole. Repeat layers. Bake 20 minutes or until thoroughly heated. Top with shredded lettuce and chopped tomato if desired. Makes 6 servings. 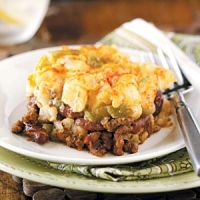 Recipe categories: Main dish, Casseroles, Ground beef.